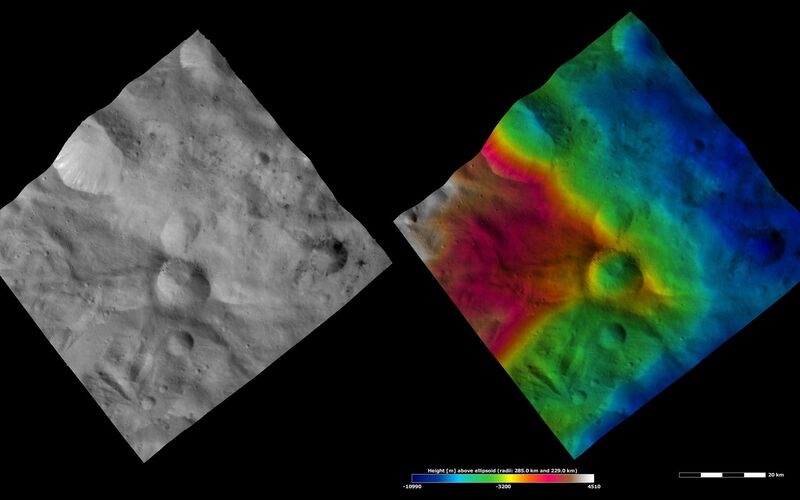 The left-hand image is a Dawn FC (framing camera) image, which shows the apparent brightness of Vesta's surface. The right-hand image is based on this apparent brightness image, which has had a color-coded height representation of the topography overlain onto it. The topography is calculated from a set of images that were observed from different viewing directions, which allows stereo reconstruction. The various colors correspond to the height of the area. The white and red areas in the topography image are the highest areas and the blue areas are the lowest areas. Helena crater is the center crater in the vertical line of three craters in the center of the image. Laelia crater is in the right corner of the image. There are small patches of dark and bright material around the rim of Helena crater and a mound of material in the center of the crater, which was deposited after material cascaded down the side of the crater. There is an elongate depression to the left of Helena, which shows up clearly in the topography image. 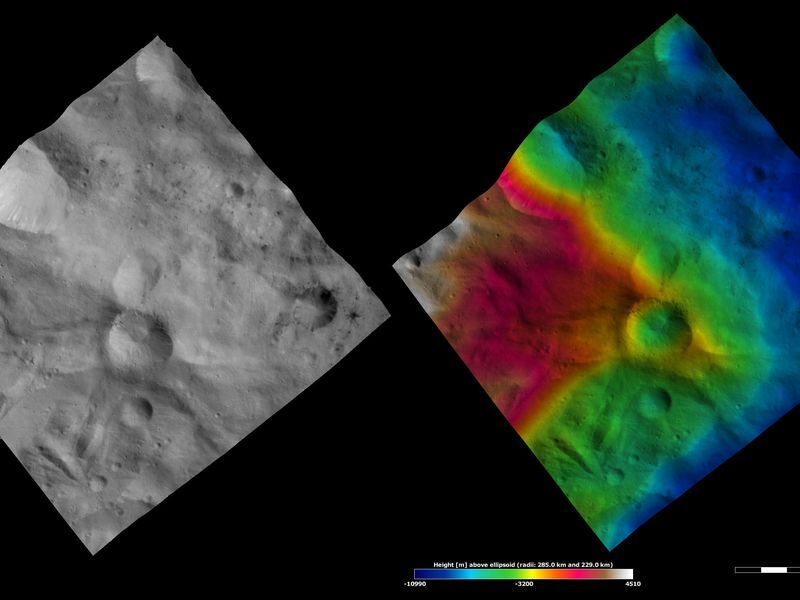 The topography image also shows that Helena crater formed on a strongly sloping part of Vesta's surface. 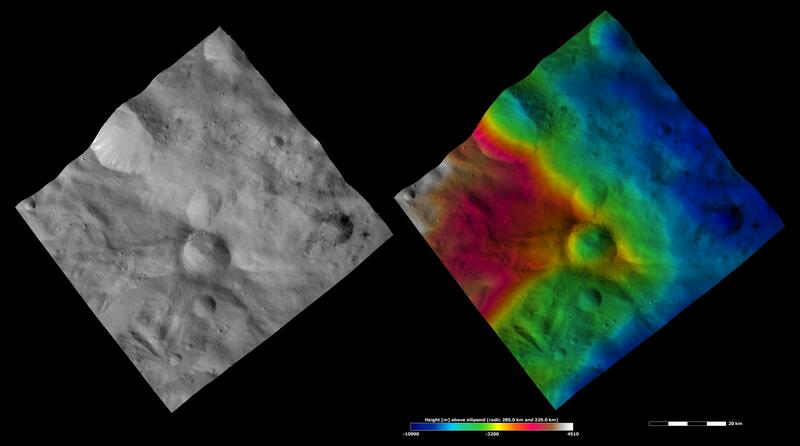 These images are located in Vesta's Sextilia quadrangle, in Vesta's southern hemisphere. NASA's Dawn spacecraft obtained the apparent brightness image with its framing camera on Oct. 13, 2011. This image was taken through the camera's clear filter. 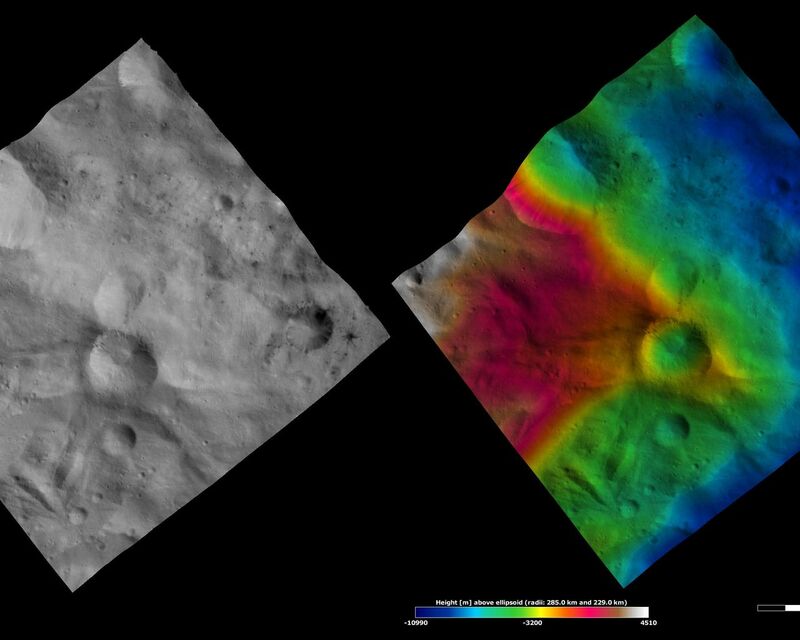 The distance to the surface of Vesta is 700 kilometers (435 miles) and the image has a resolution of about 70 meters (230 feet) per pixel. This image was acquired during the HAMO (high-altitude mapping orbit) phase of the mission. These images are lambert-azimuthal map projected.